Despite an impressive variety in art direction and environments, Soul Axiom's puzzle design is shallow and frustrating. What is it? A first-person puzzle game about exploring digital memories. Soul Axiom wants to be a huge, cerebral puzzle game. I admire the scope and variety of its modular environments, each with completely different aesthetics and puzzle mechanics. It has an intriguing story that spans generations, built on weighty concepts like the soul, the depths (or absence) of human consciousness, and scientific ethics. Soul Axiom is imposing and impressive from a distance, the silhouette of a skyscraper. But upon closer inspection the looming shadow is just a topsy-turvy paper mache idol held together by twigs and rubber cement. 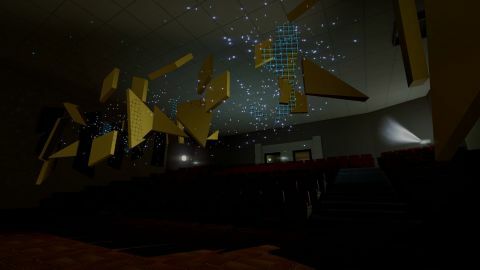 In the first-person digital dreamscape of Soul Axiom, you’re tasked with entering fragmented memories, which are independent levels dotted with locked doors, laser puzzles, and purple-faced bald guys. The goal in each is to find and touch a digital corpse in order to hallucinate the past. Translation: as a digital soul exploring the Matrix-like assembly of humanity’s hard drive memories, you’re to explore each memory and solve the puzzles inside in order to find out where humanity went and how you arrived. Think The Talos Principle, but with more locales and less fun. From hokey haunted mansions to space stations that recall System Shock, Soul Axiom’s visual palette is all over the place in a good way, even if the scenes themselves are fairly static and lack minute detail. It looks like a game out of the mid 2000s, where CG cutscenes with obscene artifacting, low poly models, and inconsistent collision were in vogue. It often looks nice from far away, but closeups reveal a lack of detail in texture and geometry. You interact with the environment and solve puzzles with a handy set of first-person cyber superpowers. They let you shift blue-tinted objects in and out of existence with a click, ‘rewind’ or pause green-tinted objects on a predetermined path, and shoot and destroy orange-tinted objects. But clicking the mouse buttons to use each power feels sluggish. There’s a noticeable delay in how each executes, with the frilly hand animations and grating sound cues playing out before each ability kicks in. The rewind-play power is used more than most, and clicking to pause an object in its movement or animation takes about half a second to register. I already figured I’d never use a VCR again, but now I want to throw them all into a fire. Input problems aside, I was excited to see how the puzzle rules and object manipulation powers would stack and change over the course of the game. They don’t. Objects subject to the powers are rare, tinted in the color they’re exclusively affected by, and often arbitrarily. One hallway scene required me to blow up some wood panels to get through. A nearby hallway was blocked off by the same wood panels, but because they weren’t orange, I couldn’t interact with them. Without consistency in the puzzle rules, I couldn’t trust any information I observed to be useful. Soul Axiom’s puzzles are rarely challenging, and if they are it’s because they’re poorly communicated or outright bugged. In one instance, I had to turn valves in a certain order to douse the fire on a helicopter in a military base. I completed the puzzle early on, but had no idea because even though the fire disappeared, the fire crackle sound effect was still emanating from the helicopter. Puzzles that work involve pulling switches, pressing buttons, or using the dissolve-fill, rewind, and explosion powers in some regard, but rarely in combination. Teleporting into a new area and exploring until I figured out its particular puzzle schtick was neat, even if the gratification was as shallow as discovering how to turn on a light switch as a toddler. Once I figured out an area’s gimmick, it was just a matter of going through the motions. In a puzzle involving owl statues that bounced multicolored lasers around (time to laser puzzles: two hours), I had to blow up the orange-tinted owl because that was the only possible way to interact with it, rotate (rewind) the two green-tinted owls because that was the only possible way to interact with them, and so on. The puzzle solved itself. There was no deduction or problem solving involved, just observation and execution. At their best, the puzzles provide the same satisfaction as putting together an Ikea desk. At their worst (some rewind puzzles require manipulation and traversal of platforms over a deadly pit), the Ikea desk makes you start over if you mess up or leave the room. Yep, return to the hub world before finishing an area and the puzzles reset without warning. There was no deduction or problem solving involved, just observation and execution. I love reading, but I don’t finish a novel by flipping between pages at random. Soul Axiom leans into its epistolary storytelling (finding notes, letters, emails, and so on) way too hard. Piecing together a big branching story is hard enough when no single level is the same. It’s especially difficult when they’re littered with pieces of writing that repeatedly reference characters I can’t easily anchor to anything I’ve seen. From what I gathered, I was a digital soul interfacing with a cyber memory safe. My goal was to piece together information from each memory, none of which were necessarily my own, in order to learn more about the corporation that created the memory and soul backup software. Nothing is blatantly clarified. I visited a hidden temple in a jungle, an island-bound lighthouse, a spooky lab where children were experimented on, an ice dimension, and more. I loved the variety of the unexpected locales, but without a clear through line, I was left skating on the edge of hope towards some grand revelation that never came. And even if it did, long before I reached the end I’d lost all motive and interest in unravelling Soul Axiom’s plot. I’m not against nonlinear stories, but every level and note was a heavy nudge towards something I couldn’t quite make out, and that’s disappointing. By the end, I could only recall glimpses of names, recurring faces, lofty themes and symbolism, and the stilted animation and awkward VO from the sparse cutscenes. I dug the ideas Soul Axiom poked at, even if they’ve been run through the sci-fi grinder innumerable times. But without whipping out my conspiracy theory notebook, the story floated right on by. Soul Axiom nearly gets by on intrigue. For the first two hours, however inconsistent, I was curious to explore the varied environments and play around with the shallow puzzles. But once I realized there wasn’t much to it beyond poking, prodding and running back and forth until I heard a ding that signaled I’d done something right, no change in scenery could save Soul Axiom from boredom or frustration. Make the wall go away. Entering new environments maintained my curiosity for a while. The spooky mansion wasn't too spooky after the number lock puzzle.